In May 2011 I added an Olympus PEN E-PL2 micro four thirds camera and through 2012 it remained my main camera. I have added lenses and accessories and have been very pleased with the performance. For more information on this camera system see my page with links related to the E-PL2 camera. In the future I will probably upgrade to newer Olympus micro four thirds equipment. Update: In August 2012 I started riding an adult trike, the Terra Trike Rambler. I am hoping this will extend my range. It is definitely good exercise and should open up new photographic possibilities. Today was a celebration of the opening of Twisted Fiber Arts in the lower level of Kean's Store. The Mason Chamber of Commerce participated in the official ribbon cutting. With bad weather outside the ribbon cutting was performed in the retail area. The photo at the right shows the ribbon halves flying apart as owner and creator Margaret (Meg) Campbell-Crawley cuts the ribbon with the giant scissors along with partner Anne Boll on the left. Meg's husband Jeff stands behind her with her daughter Hazel to the right of her. Anne's husband Jeff is holding the ribbon at the extreme left. More photos of Twisted can be seen on the Open House page. Go to: Twisted Fiber Art Ribbon Cutting. The much anticipated opening of a Mason bakery arrived on Saturday, December 8 and people crowded in to see the delights being offered by Nana (Roseanne Sherwood) in her Nana's Sweet Treats store. Original recipes from her mother are used here to prepare many delicious treats such as donuts, cupcakes, muffins, cookies and cakes. I was welcomed in to take photos during the construction phase and reproduce some of the photos along with pictures of the opening day. Go to: Nana's Sweet Treats. The annual Down Home Days were celebrated on Saturday around the Ingham County Courthouse in downtown Mason. It's always a fun day with a lot of vendors, food and a little entertainment (when I was there Fading World was performing). Since the weekly Farmers Market takes place on Saturday mornings they just occupied basically their regular spot on Maple Street north of the courthouse and extended their hours to that of the other vendors. This is normally a colorful event and a chance to pick up some great baked goods and do some interesting shopping from professional businesses to serious crafters and organization fund raisers. Go to: 15 September 2012. I rode my Trike over to Kean's Store today for the open house with my daughter Meg's business and the Margaret Ross Jewelry Design Studio. My daughter recently expanded her business out of her house to the lower level of Kean's store. Kean's had an open house for their own business plus the two businesses resident within Kean's. I concentrated on my daughter's yarn dyeing and design business but took photos of all three businesses. Go to: Twisted Fiber Art Open House with Kean's and Margaret Ross Jewelry Design Studio. I have finally conpleted the second web page for the Sundried Music Fest and made some minor updates to the Bands page descibed below. It was an exhilarating experience and well worth the effort. I am already looking forward to next year's 4th annual event. The photos on this web page show the event apart from the bands with separate photos for the childrens' area and the Farmers Market that was displaced to a local park to make room for the vendors on Maple Street. I'm hoping to add some video clips to The Bands page in the future for some of the bands. Time will tell. Go to: 2012 Sun Dried Music Fest. 15 musical groups participated in the 3rd annual Sun Dried Music Fest in Mason, drawing large crowds to enjoy the fun. I determined to document all the bands this year along with the surrounding activities. I made frequent trips to downtown Mason on my Terratrike, though after dark I decided to play it safe and walk (no lights on my trike, yet). After a tiring two days and about 400 exposures I started the long work of editing the photos and web pages. Due to the size I divided coverage into two pages, one for the event in general and one devoted to coverage of the individual bands. Here is the first page finished showing the musical groups that participated. I hope to add some video clips later and will certainly add the second page devoted to the event in general quite soon. Go to: 2012 Sun Dried Music Fest - The Bands. Sometimes I have the need for a short, fast walk to help lower my blood sugar level quickly. Usually 15-20 minutes is sufficient. I have a stardard route that cuts through downtown Mason and accounts for 1.5 miles. I can do this walk in about 22 minutes. Sometimes I vary cutting a bit south by the railroad crossing on south Jefferson Street, sometimes walking the rails north through town, sometimes preferring the Hayhoe Riverwalk. I usually move fast and leave the camera behind, frequently walking when it is dark, sometimes as late as 2am, when photography is problematic. On July 22, 23 and 25 I took a series of these short walks and did take my camera, deciding to just take some pictures for the fun of it. I looked for colors, patterns and interesting reflections. Downtown Mason has some amazing reflections, occasionally allowing for some fun self-portraits in window reflections. Many of the houses have great geometric shapes. The railway has attractive vegetation and water runs in attractive creeks. This is a great town for photography! Go to: 22-25 July 2012. Tonight a high BG number dictated that I get some exercise immediately to run the number down. I took a 2.4 mile walk (my new trike is in the shop), as indicated by the pedometer in my phone. I stopped several times to chat with other Mason residents so the walk took 75 minutes. However, I saw quite a bit of Mason. I walked part of the Hayhoe Riverwalk, visited Griffin Park and Lee Austin Park, enjoyed "walking the rails" on the railroad tracks, visited my new friend Jim Cook at Tiki Jim's Hawaiian Food Hut (see 4 Aug 2012 for more pictures), Met some fellow Mason residents and two delightful children, checked out the burned out building of ServiceMasters (see photo at right), and visit some residents of the Jefferson Street Square building. Go to: 11 Aug 2012. Tiki Jim's Hawaiian Food Hut opened today. 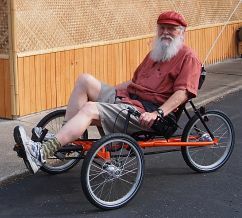 As supper time arrived I headed over on my new recumbant trike to pick up some food. I met the owners Jim & Debbie Cook and enjoyed our conversation about their new restaurant and how it came about. Their concession trailer has been a frequent part of many festivals in Michigan, but finally they found a permanent home for their food service here in Mason in a building formerly occupied by a local pet grooming enterprise. Their first customer Missy Bailey arrived while I was there and I got to photograph her signing the dollar bill she had used in that first purchase. Oh, I got the Hula Dog for my wife and the Mushroom Swiss Burger (with gravy!) for myself. I'm already thinking about that Pulled Pork Plate. Go to: 4 Aug 2012. I wasn't up for much today, but my BG level dictated that I needed to take a walk. This gave me the opportunity to view some of the annual Mason Independence Day parade, which passes within a block of my house. Of course, this is a great occasion here in Mason, and all the usual entries were there ... tractors, fire trucks, school band, politicians, classic cars and children. I went light carrying only my Olympus PEN E-PL2 camera with pancake lens (Panasonic 20/1.7). I missed the end of the parade but still got some good representative shots. My favorite was the girl at the right dressed in her partriotic dress for the occasion. Thanks to her parents for allowing me to take this shot for this web page! The Sun Dried Music Fest will be coming up in August so look for some shots of that coming up here. Go to: 4 July 2012.